Coffee is a favorite in many homes; many people want to have a warm mug of cappuccino at home. One of the gadgets used in making such beverages is a milk frother. Put simply, a frother agitates milk to create bubbles within it making it light in texture and upping its volume. The foamy resultant complements the sharp flavor of coffee used to brew cappuccinos. This results in a smoother and tastier coffee. 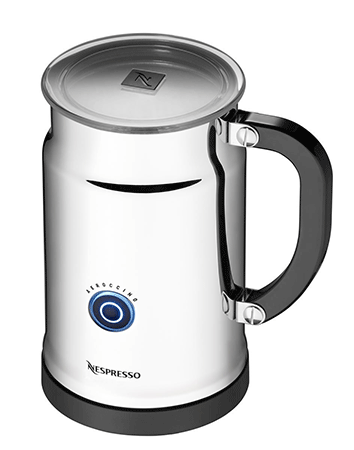 The best milk frother for you should meet your budget and your coffee making routine. Other factors to consider include capacity, durability, speed, noise, weight, and warranty. There are three main types of frothers; hand pumps, motorized whisks, and electric frothers. For those who make one or two cups of coffee at a time and do not need a lot of foam, a hand pump frother, one that requires you to manually create the foam, comes handy. Motorized whisks, which are handheld appliances that use AA batteries, are great for a large amount of coffee while electric frothers are automatic, are the fastest, most effective and most expensive. 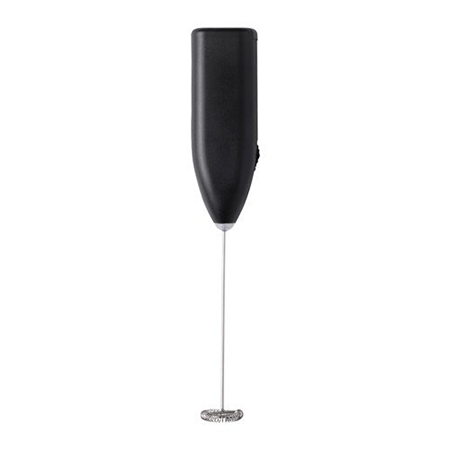 At 20 x 6 x 6 cm, the Norpro Froth Master is a small sized frother that gets the job done. 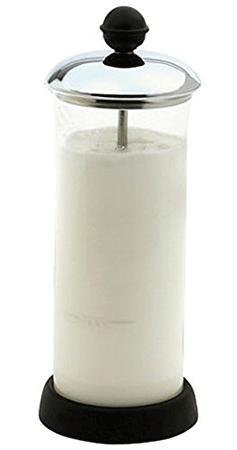 It is a hand pump frother, which means it manually aerates milk and can froth up to 1/3 cup or 80ml of milk at a go. 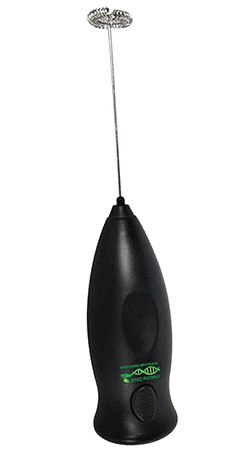 The design of the frother ensures that pumping for between 10 and 20 seconds will produce enough foam. Tempered glass casing offers durability. Better yet, it is detachable from the rubber base for washing. The frother comes accompanied by recipes and instructions for easy use. The Elementi runs on 2 AA batteries (which are not included in the package) and features a powerful, fast and high torque motor that produces foamed milk in a record 40 seconds. It is created stylish and small enough to ease storage. This tool creates velvety smooth foam used to make cappuccinos, lattes and macchiato among others. 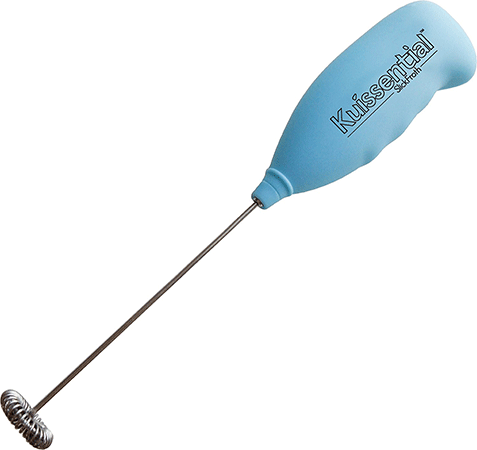 Seeing that this is a handheld frother, it features an ergonomic grip which is soft to touch for easy operation. 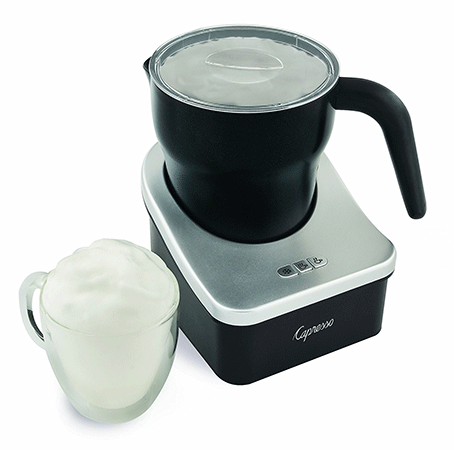 Chefs Star is an electric frother; ergo, besides creating a luscious creamy froth, it heats milk. All this happens at the press of a button. The frother heats and creates foam in 80 seconds or less and is great in making lattes, chai, hot chocolate and cappuccinos. 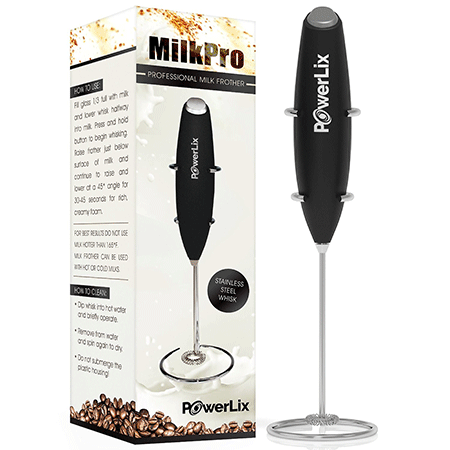 PowerLix is a simple handheld frother that comes with a stand for easy storage. 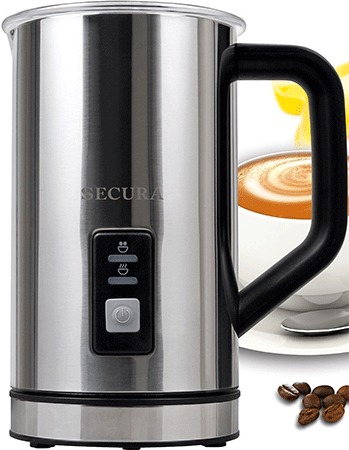 It is ideal for making coffee, cappuccino, latte and hot chocolate. 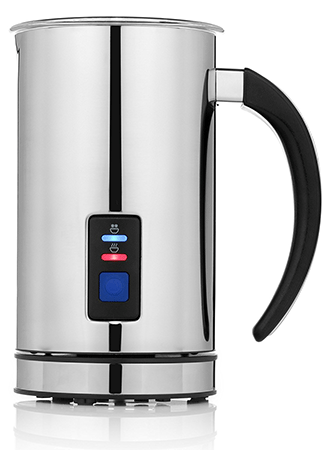 This product only needs the user to put hot or cold milk in it and turn it on; it froths milk in 20 seconds or less. Powered by 2 AA batteries, MatchDNA is a handheld milk frother ideal for making cappuccino, latte, hot chocolate and macchiato among others. The frother creates foam in less than 20 seconds. It can froth milk up to 1/4 a glass. Capresso FrothPRO is an automatic milk frother designed to produce thick creamy foam for cappuccinos and café lattes at the touch of a button. The frother comes with three temperature settings; cold, warm and hot. Secura can froth hot or cold milk to produce velvety foam. 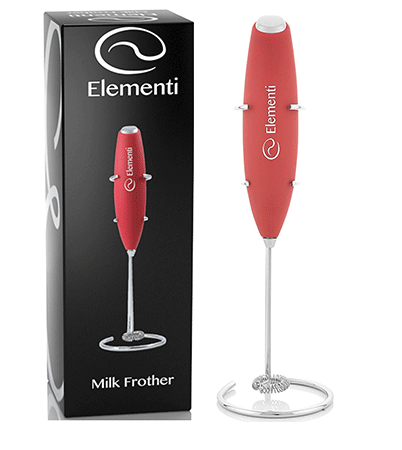 The frother can heat up to 250ml milk and froth up to 125ml milk for cappuccinos or lattes. Being electric, all action occurs at the touch of a button. Ikea is a handheld, battery-powered milk frother designed to create coffee-shop-quality lattes and cappuccinos. This gadget operates on 2 AA, 1.5v batteries, and froths between 2 and 3 ounces of milk at a time. It features a high-speed motor that froths milk in less than 20 seconds. Even better, milk can be frothed when hot or cold. A simple design makes it easy to operate and clean while its stainless steel material enhances its durability. Ideal for coffees, hot chocolates and milkshakes, the Slickforth 2.0 is a handheld milk frother designed to offer smooth barista-quality beverages. It operates on 2 AA batteries. Though it comes with standard frother features, the manufacturer has sealed all loopholes to make this one of the best mid-range milk frothers. It sports a stylish ergonomic handle with stainless steel frame and a food safe stainless steel whisking head. With a frothing capacity of up to 130ml and a heating capacity of up to 250ml, this automatic milk heater and frother is ideal for a large family. Even better, it comes with a max and min level indicator and makes great lattes, cappuccinos, and milkshakes. It runs on 120V electric power. Capable of heating and frothing milk in less than 70 seconds, this frother is better than most frothers regarding functionality, price, and usability. With so many milk frother brands on the market today, it is a daunting task picking one that produces the quality of coffee desired. Though the above-listed frothers are among the best on the market, there are other good frothers. Before buying, one should compare frothers regarding functionality, usability, durability and affordability.